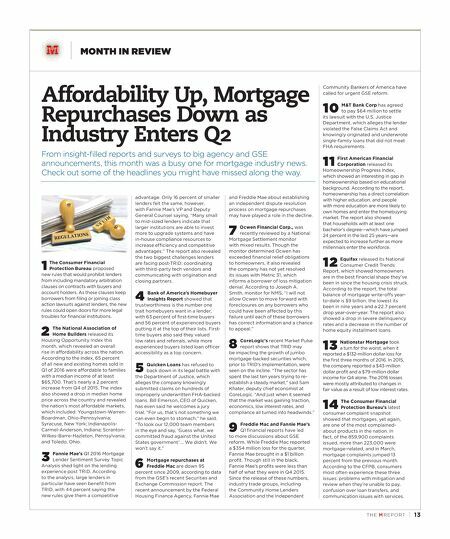 TH E M R EP O RT | 13 MONTH IN REVIEW Affordability Up, Mortgage Repurchases Down as Industry Enters Q2 From insight-filled reports and surveys to big agency and GSE announcements, this month was a busy one for mortgage industry news. Check out some of the headlines you might have missed along the way. 1 The Consumer Financial Protection Bureau proposed new rules that would prohibit lenders from including mandatory arbitration clauses on contracts with buyers and account holders. As these clauses keep borrowers from filing or joining class action lawsuits against lenders, the new rules could open doors for more legal troubles for financial institutions. 2 The National Association of Home Builders released its Housing Opportunity Index this month, which revealed an overall rise in affordability across the nation. According to the index, 65 percent of all new and existing homes sold in Q1 of 2016 were affordable to families with a median income of at least $65,700. That's nearly a 2 percent increase from Q4 of 2015. The index also showed a drop in median home price across the country and revealed the nation's most affordable markets, which included: Youngstown-Warren- Boardman, Ohio-Pennsylvania; Syracuse, New York; Indianapolis- Carmel-Anderson, Indiana; Scranton- Wilkes-Barre-Hazleton, Pennsylvania; and Toledo, Ohio. 3 Fannie Mae's Q1 2016 Mortgage Lender Sentiment Survey Topic Analysis shed light on the lending experience post TRID. According to the analysis, large lenders in particular have seen benefit from TRID, with 44 percent saying the new rules give them a competitive advantage. Only 16 percent of smaller lenders felt the same, however, with Fannie Mae's VP and Deputy General Counsel saying, "Many small to mid-sized lenders indicate that larger institutions are able to invest more to upgrade systems and have in-house compliance resources to increase efficiency and competitive advantages." The report also revealed the two biggest challenges lenders are facing post-TRID: coordinating with third-party tech vendors and communicating with origination and closing partners. 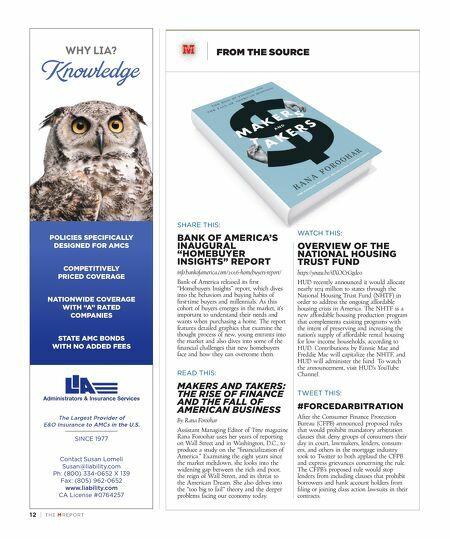 4 Bank of America's Homebuyer Insights Report showed that trustworthiness is the number one trait homebuyers want in a lender, with 63 percent of first-time buyers and 56 percent of experienced buyers putting it at the top of their lists. First- time buyers also said they valued low rates and referrals, while more experienced buyers listed loan officer accessibility as a top concern. 5 Quicken Loans has refused to back down in its legal battle with the Department of Justice, which alleges the company knowingly submitted claims on hundreds of improperly underwritten FHA-backed loans. Bill Emerson, CEO of Quicken, has even said he welcomes a jury trial. "For us, that's not something we can even begin to stomach," he said. "To look our 12,000 team members in the eye and say, 'Guess what, we committed fraud against the United States government' … We didn't. We won't say it." 6 Mortgage repurchases at Freddie Mac are down 95 percent since 2009, according to data from the GSE's recent Securities and Exchange Commission report. The recent announcement by the Federal Housing Finance Agency, Fannie Mae and Freddie Mae about establishing an independent dispute resolution process on mortgage repurchases may have played a role in the decline. 7 Ocwen Financial Corp., was recently reviewed by a National Mortgage Settlement monitor with mixed results. Though the monitor determined Ocwen has exceeded financial relief obligations to homeowners, it also revealed the company has not yet resolved its issues with Metric 31, which informs a borrower of loss mitigation denial. According to Joseph A. Smith, monitor for NMS, "I will not allow Ocwen to move forward with foreclosures on any borrowers who could have been affected by this failure until each of these borrowers has correct information and a chance to appeal." 8 CoreLogic's recent Market Pulse report shows that TRID may be impacting the growth of jumbo mortgage-backed securities which, prior to TRID's implementation, were seen on the incline. "The sector has spent the last ten years trying to re- establish a steady market," said Sam Khater, deputy chief economist at CoreLogic. "And just when it seemed that the market was gaining traction, economics, low interest rates, and compliance all turned into headwinds." 9 Freddie Mac and Fannie Mae's Q1 financial reports have led to more discussions about GSE reform. While Freddie Mac reported a $354 million loss for the quarter, Fannie Mae brought in a $1 billion profit. Though still in the black, Fannie Mae's profits were less than half of what they were in Q4 2015. Since the release of these numbers, industry trade groups, including the Community Home Lenders Association and the Independent Community Bankers of America have called for urgent GSE reform. 10 M&T Bank Corp has agreed to pay $64 million to settle its lawsuit with the U.S. Justice Department, which alleges the lender violated the False Claims Act and knowingly originated and underwrote single-family loans that did not meet FHA requirements. 11 First American Financial Corporation released its Homeownership Progress Index, which showed an interesting in gap in homeownership based on educational background. According to the report, homeownership has a direct correlation with higher education, and people with more education are more likely to own homes and enter the homebuying market. The report also showed that households with at least one bachelor's degree—which have jumped 24 percent in the last 25 years—are expected to increase further as more millennials enter the workforce. 12 Equifax released its National Consumer Credit Trends Report, which showed homeowners are in the best financial shape they've been in since the housing crisis struck. According to the report, the total balance of mortgage write-offs year- to-date is $9 billion, the lowest its been in nine years and a 22.7 percent drop year-over-year. The report also showed a drop in severe delinquency rates and a decrease in the number of home equity installment loans. 13 Nationstar Mortgage took a turn for the worst, when it reported a $132-million dollar loss for the first three months of 2016. In 2015, the company reported a $43-million dollar profit and a $79-million dollar income for Q4 alone. The 2016 losses were mostly attributed to changes in fair value as a result of low interest rates. 14 The Consumer Financial Protection Bureau's latest consumer complaint snapshot showed that mortgages, yet again, are one of the most complained- about products in the nation. In fact, of the 859,900 complaints issued, more than 223,000 were mortgage-related, and in March, mortgage complaints jumped 13 percent from the previous month. According to the CFPB, consumers most often experience these three issues: problems with mitigation and review when they're unable to pay, confusion over loan transfers, and communication issues with services.